For 1000’s of years Peruvians have touted Maca as a SAFE refresher to energize, increase stamina, support healthy fertility, libido, performance and more. As leading experts in the online natural supplement space we KNEW they didn’t need to charge that much to deliver the best maca root powder on the market – even if it is organic! So we went straight to the SOURCE – Peruvian farmers – bringing it to you – our online family! We know you’ll love how this organic superfood supports your healthy hormone levels, enhances your vitality, and empowers you to sustain your energy through the most exhausting, stressful days and toughest workouts and even empowers you to experience healthy, radiant skin from the inside out! Want to transform every bite you eat into a NUTRITIONAL POWERHOUSE? Simply add it to your favorite recipes - our family loves to use it to enhance otherwise bland keto, low-carb recipes and appreciate knowing that we’re helping each other live a healthier, longer, fuller life! So if you struggle to squeeze all the nutrients you need into your busy daily routine you’ll want to try this Raw Organic Maca Powder risk free for 30 days – we guarantee you’ll experience all the benefits we claim here or simply email us and we’ll provide you with a full, no-hassle refund, no questions asked! 100% ORGANIC maca powder does more than provide the ADAPTOGENIC QUALITIES that support your body to ACHIEVE normal HORMONAL BALANCE, SEXUAL PERFORMANCE and FERTILITY. STOP STRESSING OUT about INFERTILITY, getting PREGNANT, SEXUAL PERFORMANCE or LIFE in general! STRUGGLE NO MORE WITH exhaustion and crazy mood swings. PERUVIAN TRIBES, NATUROPATHS and SPORTS PERFORMANCE COACHES have seen maca roots proven ability to SUPPORT ALL-DAY ENERGY, PROMOTE NORMAL HORMONAL BALANCE, INCREASE STAMINA STRENGTH & WORKOUT PERFORMANCE, PROMOTE FOCUS/MEMORY, IMPROVE MOOD, SUPPORT GLOWING SKIN and even provide relief from effects of chronic fatigue, irritability, and poor athletic performance. SURE, OTHER ORGANIC MACA POWDERS ARE GELATANIZED BUT the low-heat process to create gelatanized maca STRIPS YOUR MACA ROOT of the FULL SPECTRUM OF NUTRIENTS, which is why it doesn't actually help you get the results you want. 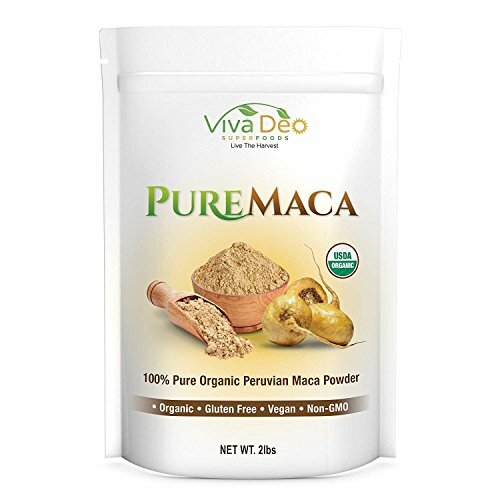 Pure Maca Root Powder is RAW, not gelatinized, leaving 100% of NUTRIENTS, ENZYMES and GLUCOSINOLATES INTACT, so you GET THE FULL BIOAVAILABILITY & NUTRITION Peruvian Maca Powder delivers. OUR YUMMY MACA POWDER BLENDS beautifully with any recipe including smoothies, soups, energy bars, baked goods, oatmeal and more, complimenting and enhancing your favorite meals while INCREASING the NUTRITONIAL VALUE in EVERY BITE - Studies show it's an AWESOME SOURCE of Protein, Fiber, Vitamin C, B Vitamins, Calcium, Iron, Potassium, Copper, Manganese, Fatty Acids and more - making it EASY to SQUEEZE the GOOD STUFF you NEED into your BUSY DAILY ROUTINE! WE'RE MORE THAN THE BEST value organic maca powder. Truth is our FAMILY is on a MISSION to empower you to experience OPTIMAL HEALTH and an amazing LIFT in ENERGY with our USDA Organic Certified, Non-GMO, vegan, gluten free Peruvian Maca Root. Our recipe is AUTHENTIC, and SAFE so you can add to your cart now and try it RISK FREE for 30 days. You'll get all the benefits we say you will, and more or simply reach out and we'll provide you with a NO HASSLE REFUND - no questions asked! If you have any questions about this product by Viva Deo Superfoods, contact us by completing and submitting the form below. If you are looking for a specif part number, please include it with your message.